The day has finally (or already?) arrived! The exciting Holiday boutique starts today! I have been busy for the last week or so making things to stock up my etsy shop. I heard that there are 30 (well, including mine) wonderful booths being setup. I made tons of flower clips, oil cloth pencases (from Moda and Michael Miller) and a few new bags. Now my shop is ready to go, I am starting to get really nervous...Ahhh! Also, I am offering special deals just for this Ucreate Holiday boutiqe, so please head over to Ucreate to see what deals I am offering. Then click the banner to goto my shop and show some love! I have lots of craft and tutorial ideas, but I don't have any time left to do those right now. So, I will share something else today. I love vintage linens! I found four beautiful pillow cases. I have been collecting them, but finding ones with a pretty design in such a good condition is hard to come by. I love shabby chic style so I can use them as is or I might make a quilt out of them someday. With the blue one, I am even thinking about making Rachel a summer dress! The book was printed in the early 1970's. See how pretty the illustrations are! They remind me of some of the books I read when I was a little girl. I know these books will be perfect additions to Rachel's bookshelf. I hope she will enjoy them and treasure them in the years to come. Lately I have been really busy, just like everyone else during this season, doing stuff around the house and trying to squeeze in some time to work on things for the up coming Holiday Boutique. I would be very lucky if I can get three... well even two hours of sewing time a day. I will share a basket makeover I just did, and I am going to list this on my etsy shop! I love baskets! I have some basket style handbags for the summer, but non for the Fall and Winter. I think this basket is perfect for the season with dark brown colors. I added lining and a top with a draw string. Also, I thought the fluffy feather and velvet ribbon would enhance the Fall and Winter feel. I love how it turned out!... eventhough it is so tempting to claim it as mine, everything I do and create needs to be for the boutique. I need to focus! Well, this post will be the last one before Thanksgiving, I hope everyone will have a wonderful time with their loved ones. Happy Thanksgiving to you all! First of all I want to say "Thank You!" to all of you who came and participated in this Thanksgiving giveaway party! There were so many of you (135 of you right? ), more than I anticipated and it was very exciting! I read each one of your thankful notes. Some of them were light and fun, some peoples' thankfulness came from life's challenges and tribulations. As I read all of the thankful notes, my thoughts went out to my family and friends. I think focusing on the blessings we already have help us to realize that there are so many more blessing than we notice at first glance. Again, thank you for sharing your thoughts! I hope everyone will have a chance to read other peoples comments before Thanksgiving... You all have such a beautiful spirit Ladies! Congratulations to the three lucky winners!! Wow, don't be so quick to leave! I would love to share some of the things I am thankful for too... I have such a long list, but I will give you the short version. I am so grateful for my family, I can't think of my life without them in it. Because of them, my everyday life sparkles more. I am grateful for my God and faith, because of them I see my path and it gives me strength when I need it. I am grateful for the chance to create, because of the time to do so I can reconnect with myself, and be happy. There, Little Miss-Match was born. Sometimes I don't think arguing to make them wear what I want them to wear is worth it. So, I just let them. I figured that I have to pick and choose my battles. It is good to give them control in some aspects of their lives. Right? That way they might be willing to listen and obey on more important issues. If I coordinate my clothes like Rachel does, people might think that the busyness of life finally got to me... but, for some reason, kids can get away with this kind of coordination. By the way, Monday is the day for the announcement of the giveaway winners! Make sure to come back to see if you are one of the lucky winners! This week is almost over, it has been a busy week as usual. Although, there was a moment I felt peace and was actually able to spend some time with Rachel. I took Rachel to a park, It wasn't planned but it was such a nice day. I thought that I should not waste a day like this. We went to the library first then, to the park. Since it wasn't planned I just grabbed some crackers on the way out. We sat and ate the crackers together too. The entire time she would not stop talking and smiling. I have a book mark with a quote that says "The shortest way to happiness is to make someone else happy". That is so true. Her happiness was totally contagious. We laughed and played for a while. Then, it was time to go... I brought some sourvenirs home. Everytime when I look at them, I remember how I felt at the park. I collected another happy memory. 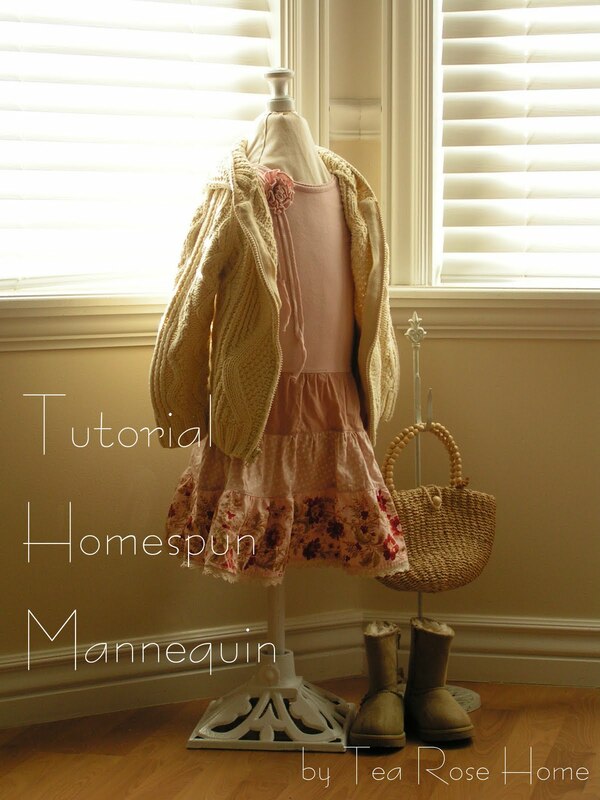 I have been wanting to get a child size mannequin for a long time. It may sound funny, but I thought it would be fun to display the clothes I made for Rachel in her room. Also, if I decided to do more open houses for Tea Rose Home, a mannequin would be a nice touch for the display. First of all, I never found one that I had in mind, the closest one was over hundred dollers. Umm... no thanks. One day, I found this Torch stand at the clearance section in Target for $6.48(originally 12.99). The detailing is beautiful... I though, "What can I use this for?"... then, a light came in my head! I can use this to make a mannequin! Just in case you want one, here is how I did it. 1. Put the wooden dowel into the torch stand and tighten the screw. Spray paint the whole thing. 2. Cut several peices of 4" wide batting for the neck. Glue the first part to the dowel and start wrapping it tightly, until you get the thickness you want. You can either sew the end or glue it. 3. Using the same method, wrap the old towel or blanket to the dowel. I folded the old blanket and made it 15" tall for the body. 4. Add batting around the neck area to make a more natural and smooth look. 5. Cover the whole thing with batting. It was easier for me to sew it on to the body. I felt like I had more control and compared to using the glue gun, it is less permanent. 6. Cover the whole body with muslin. This part is a little tricky. Especially around the neck area. Sew the body part first, then the bottom and the top. 7. Around the neck area, you will need to cut some excess fabric off. Use the glue gun to secure the fabric to the top of the dowel as you make pleats. 8. I sewed lace around it. 9. Then, screw in the topper for the finishing touch. The whole thing cost me about 17.00 dollars. If you already have a torch stand or even a wooden standing coat hanger, you can make this a lot cheaper (Ladies go hunt in your garage or basement!). Although it is not perfect I love how it turned out! Apparently, Rachel liked it too, she started bringing some clothes to put on the mannequin. She and I played dolls this morning, it was a lot of fun! With lots and lots of prayers, the support of family and friends, and advances in medicine, I was able to carry you for nine months. The C-section went well too! All I can say is you are my miracle. The last 9 years went so fast! I still can picture you as an infant in the hospital bed, snuggly wrapped. Where did the time go! I try not to let the days go by without telling you how much I love you and how proud I am of you. I try to be a fun mom and spend more time with you. Well... you know, I am the perfect example of an imperfect human being, I fall short sometimes. I just want you to remember, I will always love you, no matter what. I also want to say thank you for coming into our family. I will always be grateful for that. You are definately not a little kid anymore, I can see that you are slowly entering a different phase of life. Growing up. Trying to figure out who you are and who you want to become. Stay close to God, Mommy and Daddy will always be here when you need us. Find the things makes you happy just like I love creating. That will enrich your life so much. Enjoy each and everyday... and be happy! I am so thankful that you are my child and I have the privilage of watching you grow. Happy Birthday Buddy, my little miracle. I was so excited to look outside and see some snow falling from the sky this morning. It was such a pretty sight, I love winter. Except the part where this is also the flu season. Sickness is going around our house this week. My hubby got it worse then any of us, and he had deadlines at work he needed to meet by this Friday... poor guy. He was working from home and finally fininshed it. Now he can rest better. I decided to take good care of him like he always does for our family. There are Mikans (Japanese citrus) on the dining table for some vitamin C.
I guess I will take it easy with him, so my cough will go away too. Hopefully, I will be recharged and ready to go next week and work on more projects. I hope everyone is well and enjoying this season! I will see you on Monday! Flower hair clip for little(and big) girls. I make all sorts of colors, but I personaly like muted unusual colors. Look at the mess on my table... but it is a pretty mess right? Smokey purple and blue, the blue ones texture is almost like velvet. Perfect for this season. This green flower is also velvety. One of my favorites. After these are done, I have plans to move on to some other projects. It is so fun to think about color combinations, what beads to use and how. I will share more items as I make them. Thank you for stopping by everyone! I am so excited to see that so many of you are participating in my "Thanksgiving Giveaway"! Thank you so much! I am reading all the comments and am reminded of how blessed we all are. There is always something to be thankful for... wouldn't you agree? The giveaway will be open for two weeks, and I will post the info on the sidebar, so head over if you haven't entered yet! Come to November 30th through December 7th, My etsy store "Tea Rose Company" is participating the UCreate Holiday Boutique! I have never done this before and I am very excited about it. Thankyou Kari for inviting me!!! I am having a special discount for this occasion and I know many other shops are going to do the same, so mark your calender for the online Holiday Boutique! For the last couple of days I have been making things for my etsy store. I haven't done much lately, and my shop needs a lot more stuff for the Holiday Boutique. I am going to be busy the over the next couple of weeks! My store has a little bit of this and that; do you have something you would like to see in my shop? I would love to get your opinions on what I should make. If you have any ideas, let me know I would love to here from you all! Hi there! It is time for another giveaway! Since it is November, I name this giveaway "Thanksgiving Giveaway" and there is a different rule I want you all to follow... Well, I bet you want to know what the items for the giveaway are. I will explain the rules later. Four square frames and a Moda Charm pack. When I did this tutorial, I got such a great response and many of you wanted to know where I found the frames. They were all out at the stores, but I found some more! I decided to giveaway four of them, so if you want to follow the framed fabric tutorial, the charm pack squares are the perfect size for the project too. My daughter uses her bag for everything, but on Sunday, it becomes her scripture bag. A Doll Quilt. I actually used left over fabrics from the project I am currently working on. This turned out very cute! It is hand quilted, the size is 13 1/2" x 16 1/2". Rachel uses her's all the time to put her baby dolls to sleep. If you don't have a little girl to give it to, you can uses it as a place mat or wall hanging too. OK, here is the rule. 1, Since this is a "Thanksgiving Giveaway" instead of leaving regular comments, let me know what you are thankful for. This is sort of a pre-Thanksgiving party at Tea Rose Home! I would love to read what people are thankful for, It will remind me of what kind of blessings we have in our daily lives and I bet it will lift up others' spirits too! 1. Follow me! I would love to see your friendly faces on my side bar! 2. Blog about this giveaway on your blog and come back to let me know. When you do all those things, you will be entered three times. Unlike my other giveaways, I will keep this giveaway open for two weeks. I can't wait to read all your "thankful lists", it will be fun! As I suspected, I had a very long day yesterday. I got home late and our dinner was leftovers. Today, my sweet hubby decided to work from home, so he can help me out a little bit. It is funny, eventhough he doesn't do much, having him around is so nice. I was able to have very relaxing day today. I felt bad about last night's dinner, out of guilt I made a pretty decent one tonight. I didn't go grocery shopping, so the theme doesn't mach. They are mostly Japanese stuff. Pot Stikers --- I felt like there is something missing. Times like this, frozen pot stickers are so convenient! That was our dinner. I love to sit around the table with everyone and enjoy the meal. It is getting hard to do that during the week, that is why I want to take the time to do this as a family as much as possible. I want my kids to remember home cooked meals and how they made them feel. Just like how my mom did every single day while I was growing up. By the way ladies, I am going to post a give away on Monday! Be sure to come back to check it out. I am planning a fun theme with this give away. I can't wait to see you on Monday!! I was able to squeeze some sewing time in this morning and pieced these quilt blocks! Tomorrow is another busy day for me, I highly doubt that I can get any sewing done. It will be so nice when I can have one of those days where I have no responsibilities and am just able to sew. All day long. Design and sew... but knowing myself, pretty soon I will miss being a wife and a mommy of three kids. I guess it is good to have some balance. Sewing is a big part of my life, but my family is the biggest part of my life. They are the ones who make me happy and inspire me to be who I want to be (believe it or not). I don't have to worry about what other people think of me, because I have a very supportive and loving fan club 24-7. I didn't know those were in my mind until I start blogging. I love my life and I am extreamly grateful. Well, I am really happy to announce that, one of them is done and I am ready to share it with you all! I found this really pretty pink corduroy at Joann's and bought some before fall. I have decided to make a tiered skirt for a little girl. I used the left over fabric and made a matching necklace too. Originally, I was only going to make a few yo-yo's and sew them together, but the process was so fun I made more than I had planned and then I did some beads work as well. I think I need something like this for myself. This week is already looking very busy and crazy. On top of the reguler schedule, I have two activities that I need to attend for my church calling, two doctor's appointments (one of them takes pretty much all day, MRI, CT scan etc...and the hospital is located about one and half hours away). Also, I have a baby shower and a bridal shower that I would love to go to this weekend. Don't get me wrong, I am not complaining. I am happy that I am busy, actually I feel blessed that I can do something for other people. I just get a little overwhelmed and frustrated because of my inability to organize everything. Do you ever feel that way? I hope as I get older, I will be more graceful and wiser. It might take me another 30, 40 years, but I hope it will happen. I would love to stay and chat with you all, but I have somethings to take care of for tomorrow. I hope your Monday started out great and continues that way through out the week. Thank you for stopping by!